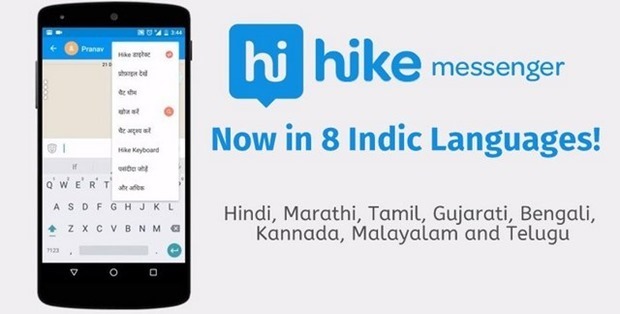 Home grown mobile instant messaging app ‘Hike’ is going multilingual with support for 8 Indian languages that includes Hindi, Marathi, Tamil, Gujarati, Bengali, Kannada, Malayalam and Telugu. The multilingual version of the app will be launched tomorrow (23rd December). Apart from supporting multi-lingual interface of the app, Hike will come with keyboard settings that will let users toggle between these 8 Indian languages. The new app will be available tomorrow on various app stores, and users will need to download the app and choose their preferred language from the dialogue box that appears at the start of the app. Users can change the preferred language at a later date from setting menu. If user wants to change the language of the keyboard they will need to tap “language and input” in settings menu and choose the keyboard language of their choice. This multi-lingual keyboard works only with Hike messenger and cannot be used for inputs to other apps. Here is a video that shows how this works. Year 2015 has been good for Hike’s growth. 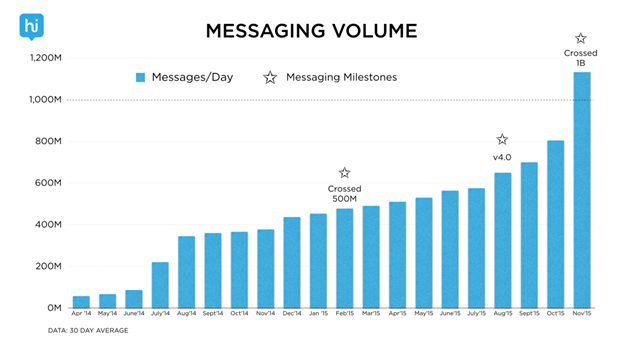 The company announced that they crossed 1 billion messages a day milestone in November of 2015. This number is more than double compared to what they had last year. Hike launched it’s version 4 in August of this year and their growth has accelerated after that. In last 3 months alone the messenger has moved from around 700 million messages a day in September to around 1.1 billion messages in November 2015. Here is a chart showing Hike’s growth. Version 4 was a major revamp which added features like photo filters and doodles to the app. Apart from it the new version also supported features like chat themes, voice calls, larger file transfers, larger groups among other things. While Hike has been growing well, it’s competitor WhatsApp has seen phenomenal growth over past couple of years. While we do not have latest figures, in all probability Whatsapp has either crossed or nearing 1 billion active monthly users mark. In September they had reached 900 million monthly active user milestone. "Hike Messenger Goes Multi-lingual with 8 Indian Languages", 5 out of 5 based on 4 ratings.